Day 1: We attended a book swap at a friends house which was great fun. Not only did the girls get new books to read for the summer, but they were able to play with a gaggle of kids for a few hours. It was the first sunny day in weeks, thank goodness. Day 2: It was a rainy day so we had a Movie Theater at home. We pulled the curtains, made some movie tickets and popcorn and then cuddled up for a movie. In the evening, they were able to go see Reptiles on the Move, where they could pet lots of snakes and lizards and other slithering animals. 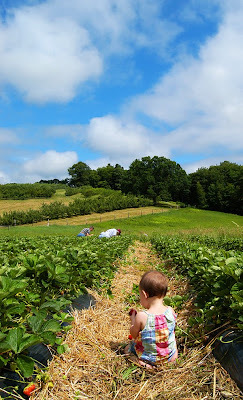 Day 3: We started the day off early early with a trip to the farm to pick strawberries... they looked so good, we ended up with 9 pounds! We then moved to the park where they were able to make some new friends to play with. Later in the evening, Colby came home and took them to the pool, which they LOVE! Day 4- Too rainy to do too much. Day 5-11: We went on vacation to Rye Beach. Needless to say, there were activities every day. From bowling to the Children's Museum in Portsmouth to the beach. We played with Nana & Papa, Leilah, Jeff, Kelly, Zack & Jozie. It was quite a gteat vacation, despite all the rain. Day 12: We went to Maine for the 4th of July to be with our extended family at Grammy & Grampy's house. We had a great time on the 4 wheeler, using sparklers and watching the fireworks. Day 14: We really had to relax a little after the vacation, so we just had a mellow day and went to the park. It was great to finally soak up some rays. Day 15: More rain!!! So, we got out early and took a bike ride. Colby extended his vacation a couple of days so he came along. Annika did pretty well at not getting too frustrated with the whole learning to ride thing. Day 16: Guess what? Day 3,807 of rain! So, no outdoor fun, but Ariana and I went to Lesley's for Wednesday Spaghetti, which gave her a chance to play with friends. Day 18: Robyn came over to play with the girls and then she slept over. They got to play outside all day. Day 19: Colb took Ariana to a birthday party. I couldn't take Annika because we thought she might have pink eye. Instead, I took her and Cady to a Dan Zanes show in Freeport, Maine. They both had fun and then we even had an ice cream after. Day 21: I took Cady and Annika to Whites Park for swimming and play time. Day 23: Well, we had a magician planned for today, but Annika and Ariana were so out of control, they both got grounded! Day 24: It was yucky out, so we didn't go outside. Day 25: Took Ariana to a hotel in Chelmsford, MA so we could spend the night for an early morning dance competition. Day 26: Dance competition until noon. And then we had Jeff, Kelly and kids over. Kelly and I took Jozie and Ariana to Manchester to see a theater production of High School Musical in the park. Day 27: I took all 3 girls in Mackworth Island in Maine to hike and build fairy houses. Day 28: It was a day of recovery from a very long weekend. Day 29: We played school for a long time today due to rain and then went to the library to enjoy some arts &crafts time. Day 30:Angel came over to spend the night. There was lots of dress up, singing and dancing. Day 31: Kaitlyn T. came over to spend the night. Lots of hide n' seek and tag. Kids are so easy to amuse (sometimes). Day 32: Kelly L. brought her kids over and we had a nice play date. The kids really enjoyed it outside with the sprinklers and mini pool. Day 33: I was away hiking in Camden, Maine so Colby took the ladies to Daisy Beach for some swimming. Day 34: We had a family day at home. Day 35: It was finally a nice day so I took the girls to the pool where they had a blast. Ok, I finally lost track of the day- I knew this would happen. It all went awry when Ariana went away for a week to go to camp with friends. She got to swim at the lake, water ski and just soak up the sun. Annika, Cay and I spent a lot of that week at the park or pool. She is gone right now for a second week to the same camp with the same friends for more sun and sand. We did go down to Boston and did the Freedom Trail, which th kids actually loved. Colb also took Ariana and a friend to Water Country for Ariana's birthday on August 16. The had a blast, water parks are something that every family should try to get to every summer. We took the girls up to camp to do some fishing and boating. They also got to go to South Pond with Nana and Papa while Mommy & Daddy hiked Mt. Waumbek. Colby took the girls blueberry picking, which I think was a first for him. He also took Ariana to Patriots training camp. Ariana came home with lots of great stories. I think we should make that a yearly tradition. Hi there. Found you on Wednesday Spaghetti.